Hi everyone! Hope you had all had a lovely weekend! With wedding season in full bloom, I wanted to share some gift ideas that are great for engagement, bridal shower, or wedding gifts. In the past year, I have been a maid of honor in my sister and cousin’s weddings. Since I was a big part of the weddings, I gave the brides gifts that were more personalized. These gifts can be altered to better fit the bride you are gifting them to. My sister and cousin loved the gifts I gave them and I also had a blast putting them together. So without further ado, here they are! My mom, Kevin’s mom, and I made this gift basket for my sister and her now husband (then fiancé) when we found out that he was proposing and we were going to Chicago the day after to celebrate with them. We wanted them to have goodies to enjoy while they began to plan the big day. 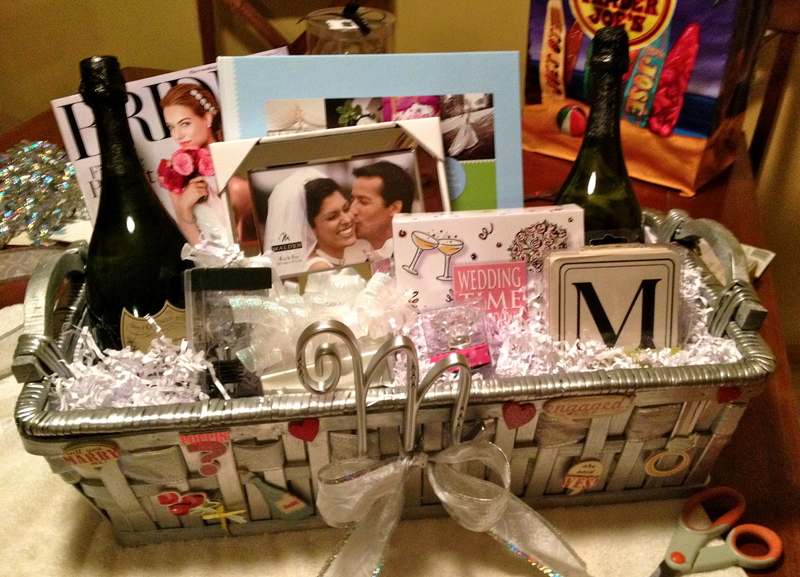 The basket consisted of two bottles of champagne, coasters with their future initial on them, a picture frame for an engagement photo, a diamond shaped wine stopper, a wedding countdown timer, a wedding planner, and a Bridal magazine. We spray painted a basket silver and added some wedding stickers and ribbon for decoration. My sister and her husband loved the gift and used a lot of the stuff in it to celebrate the engagement and plan the wedding. 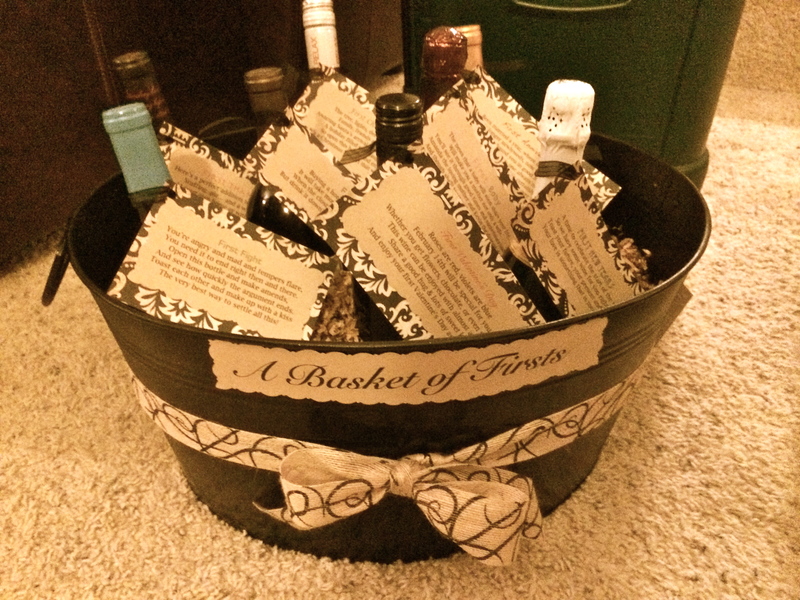 I made this wine basket for my sister’s bridal shower as a gift from her bridesmaids. Each bottle of wine corresponds to an important event that will occur in the newlywed’s lives. I included their First Valentine’s Day, First New Years, First Anniversary, First Thanksgiving, First Christmas Eve, First House, First Baby, and First Fight. I corresponded the type of wine to the event (ex: First Anniversary was Milestone brand wine). I typed up poems and hung them off of each bottle. Please feel free to comment and request the poems, I am happy to share! Amanda and Kevin have been enjoying the vino throughout their first year of marriage and still have a few left (can’t wait for First Baby someday!). For my cousin’s wedding, I wanted to get her something special instead of giving money like most people do. She still had items left on her registry so I wanted to get her some of them. 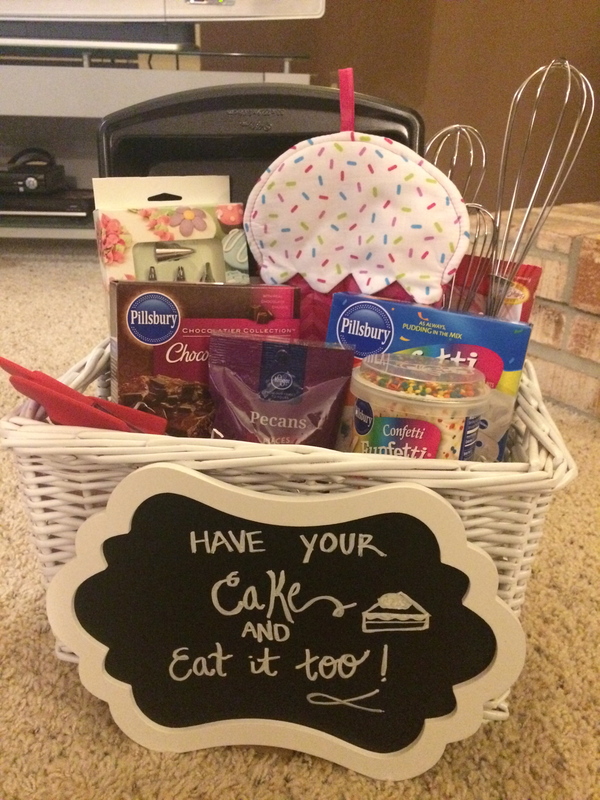 I saw that there were quite a few baking-related items on the list and decided to make a cake themed gift basket. In this basket I included spatulas, whisks, a cake pan, and cake decorating tips (all off her registry). And what are baking utensils without cake to bake with them? So I also gave her cake and brownie mixes, frosting, and nuts to bake some sweet treats. I bought the chalkboard sign at Hobby Lobby where I also happened upon the cutest cupcake hot pad I couldn’t resist purchasing. The basket is from Michael’s. I hope my cousin and her new hubby can have some fun in the kitchen together and enjoy some baked goods! When it became my sister’s wedding month (October), my mom and I sent her ten gifts so she could open one each day before the wedding. 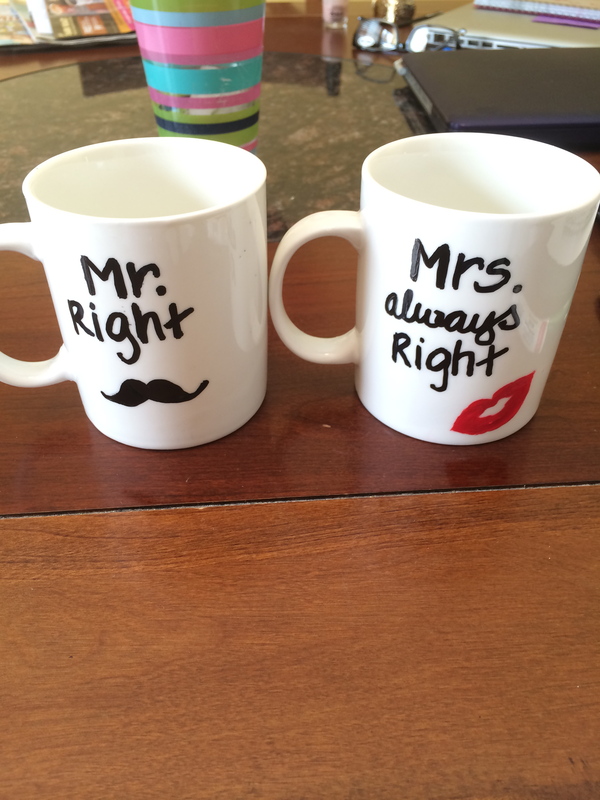 I made her mugs (shown above) by using a oil based sharpie and baking them in the oven. I would be happy to do a future post on sharpie mugs and show you some other designs and give you full instructions. Some of the other gifts we sent included magazines and snacks for the honeymoon flight, fuzzy socks in case she got “cold feet”, a wifey shirt, luggage tags, a Starbucks gift card, and nail salon gift card to treat herself to a mani/pedi before the big day. It was fun to read her text each day hearing what she opened as we all became more and more excited for the wedding. Of course these gifts could be given in a basket at a bridal shower or wedding or even individually. I hope you can use some of these ideas to create a gift for a bride or couple you know. Please comment if you have any questions. Happy Wedding Season! 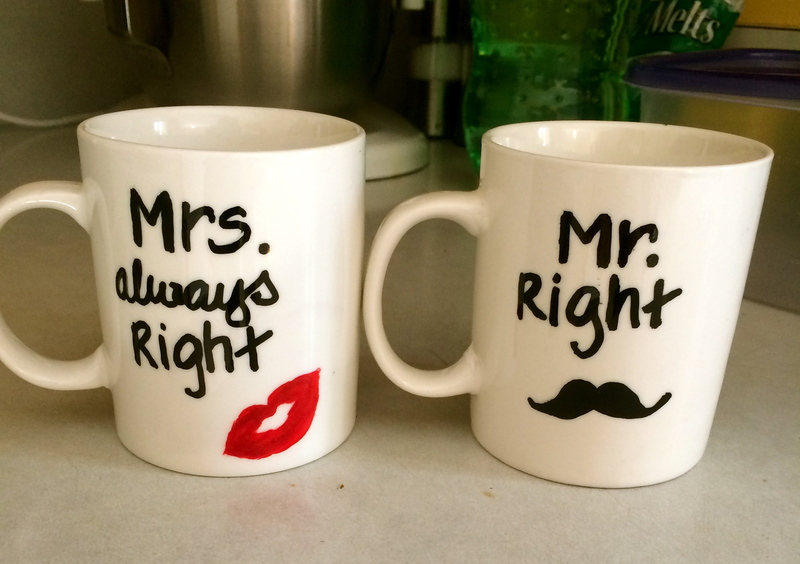 these are all adorable- love the mugs!